I don’t impulse buy books. It’s one of the things that comes with the territory of being quite type-A, and also a lover of writing and reading. I tend to only purchase books that people recommend to me or ones that have quality star ratings online. I research a lot because books are an investment –– you spend days or months with them, and you hope that they stir something within you. You hope that, like Silver Linings Playbook, at the end of your journey with them, you don’t want to chuck them out of a window in anger. Books and stories are important to me. So I shop around before I commit. But one extremely humid Florida afternoon, I retreated into the air-conditioned paradise of Borders (may it rest in peace) to try and find something that would quench my summer reading thirst. I was in college at the time, and as weird as it sounds, I kind of missed the required summer reading that I had to do while in high school. I missed sitting swimming in our pool, then coming inside the house and sitting on the cold tile floor with stiff chlorine-filled hair in order to read and highlight my copy of The Things They Carried. While I was wandering around the store, a title caught my eye. It was a white, soft-cover book with child-like handwriting on the front cover –– as if a kid had scribbled the title in bright crayon. It was a book called Room. And, after reading the back cover, I picked it up and bought it that day. I devoured the book, honestly, and was compelled by the story of Ma and Jack and the 11x11 shed that they lived in as captives. I loved that the story was told from Jack’s perspective –– from the eyes and mouth of a five-year old little boy. I thought it was an astounding thing to be able to achieve. Emma Donoghue wrote a book that had so much pain and heartbreak into a redemptive story of hope and strength, thanks to the heroism of a little boy and the love he had for his mother. When I heard that Room was being adapted into a film, I knew that I would have to see it. The trailer didn’t disappoint, nor did the fact that the script for the movie was written by the author herself. Recently, I got an email notification from a small, non-profit theater in my town that Room would be playing there over the course of a week or so. I purchased my ticket and dragged along a friend who hadn’t read the book with me, eager to see how the story played out on screen. Still, there is nothing fluffy about the circumstances that Joy (also known, to Jack, as “Ma”) finds herself in. When she was seventeen years old, she was abducted by a man who claimed his dog was sick and needed help. For seven years, she was held captive in his backyard shed and repeatedly abused physically and sexually by this man that Joy only knows as “Old Nick.” As a result of her abuser, Joy gave birth to a son named Jack and has been living with him in the shed ever since. Not exactly a feel-good story, right? But that’s where you’re wrong. Because what Room does, at its core, is remind us that amid every dark circumstance we face is the choice to believe in hope and rescue and strength. Joy makes “room” home for Jack. She makes it his world, so that he doesn’t believe or realize that there is something outside, just beyond the shed walls. His confusion over what is real and what is not is heartbreaking in the film and some of the most powerful scenes are when Joy (played beautifully by the sure-to-be award-winner Brie Larson) and Jack (played by Jacob Tremblay, who honestly deserves an Oscar for this film) yell at one another about the existence of something beyond “room.” The anguish in Joy’s desperation to get Jack to believe that there is more to the world than the few walls they are trapped by is so moving and Larson does an amazing job. Tremblay’s Jack, meanwhile, doesn’t like stories of hammocks and houses. He doesn’t like what he doesn’t know, which is typical for a child to feel. Because “room” is all Jack has ever known and to him, saying good morning to the television and the wardrobe and the sink is what life is all about. Joy is captive and yet makes “room” and everything in it feel completely normal to Jack. It’s an amazing testament to her character that she does this. And really, the film does a wonderful job dividing Joy and Jack’s story into two distinct segments –– before the escape and after the escape and depicting the struggles of both circumstances. Before I talk too much about the post-escape, I want to talk about the brilliant way that Larson and Tremblay portrayed Joy and Jack while they were being held captive. There is, as I noted above, a powerful scene where Jack yells at Joy and tells her that he doesn’t believe her stories about a world beyond “room.” He doesn’t believe that she has ever been anyone other than Ma. He doesn’t want hammocks and stupid houses. He wants what he knows. But slowly, Jack begins to accept that his mother loves him and asks questions. He’s an incredibly smart child and Joy knows this. Joy, meanwhile, struggles to continue living as a captive. She makes “room” the whole world for Jack, and the two exercise, eat food, and watch television together. But things are beginning to crumble fast and when Old Nick threatens Joy’s life, she knows that she needs to get Jack to safety. In the film, an interviewer tells Joy that she doesn’t have to be the pillar of strength for everyone –– that she is allowed to break down and cry and no one will judge her for it. In “room,” the same is true. In order for Joy to be the best mother she can be to her son, she cannot always be strong. She is human and she breaks down, spending some days too depressed to leave bed. But she is also strong and selfless and brave and still –– in spite of everything –– hopeful for a better life for herself and Jack. And if Joy cannot ensure she lives, she will make sure that Jack does. 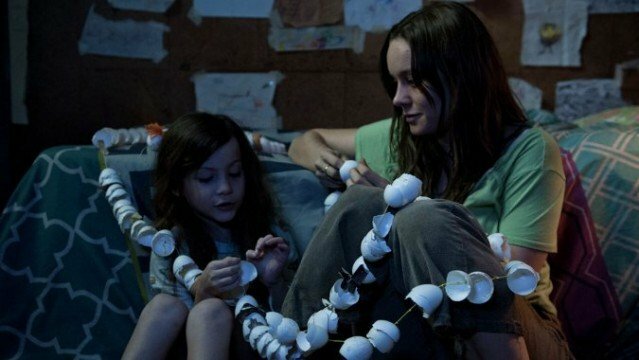 There’s this resilience and passion and strength that Larson portrays with scenes in “room.” She’s anguished, yes, and sometimes she yells at Jack. But Joy is full of compassion and love for her son –– a boy that she says later is all hers, and belongs in no way to Old Nick. And Larson completely understands the layers and complexities of Joy, a woman who –– when she leaves “room” –– is a child when captured and a more jagged version of her childhood self when she emerges. Joy was taken at the age of seventeen and had to learn to become an adult and a mother in an 11x11 shed. The complexities of a character like that are intensely difficult to navigate but Larson hits every beat with incredible force and believability. The scenes where she returns to her childhood bedroom and looks through her belongings are especially moving, and contrasted with the painful sacrifices she makes to protect Jack in “room,” it’s amazing. Joy’s struggles when she returns home –– thrust back into a life where people constantly watch her and judge her –– are played with such raw, understated emotion. The drama is contained and felt in every flicker of Larson’s eyes and her strained smiles during the interview scene. We feel the pressure within her building, as she does, right before she angrily yells at her mother. She’s in the kind of pain that exists within her mind and that pain is palpable and powerful and dangerous, culminating in a scene where Joy attempts suicide. This all sounds dark and gritty, because it is. The pain that Joy endures is not one that many people have to endure. That’s what makes Room a complex concept for a film –– how can you ask the audience to relate to a pain that the vast majority will have no frame of reference for? I’ve talked a bit about Larson’s brilliance (and she is so nuanced, so captivating that she deserves to be talked about). But we really need to discuss Tremblay’s version of Jack. Because he is the most important part of this entire film. When Jack meets his grandparents in the hospital for the very first time, they –– through their tears –– thank him for saving their daughter. Later on, it is Jack who discovers Joy in the bathroom and because of him, she is rescued from the brink of death. Jack is the key to everything in this film. He’s the redeemer in this story and he is the thing that keeps Room (both the book and the film) from being too dark and heavy. Because Jack is a child and he sees the world through the lens of a child. He sees the hope and the joy in the little things. He keeps Joy alive while in “room” and he gets her out of there. But he also gives her hope and purpose after the escape, too. Watching Tremblay portray every range of emotion –– from exuberance to anger to fear and deep sadness –– is like watching a classically trained actor. The way that Tremblay’s Jack is both innocent and also wise is so utterly moving. And the addition of voiceovers peppered throughout the film are so important because while the movie focuses on Jack and his experiences, these allow us into his actual thoughts. There is such wonderment in Tremblay’s performance and it’s beautiful. And you can see the clear transformation and growth displayed after he leaves “room” and learns how to adjust to the world. He begins as terrified and clings to his mother, hesitant to speak above a whisper or try foods that he didn’t have while in “room.” But slowly, we begin to see Jack evolve and grow. He plays with Legos. He colors. And the smile when he encounters Leo’s dog is absolutely beautiful. He learns how to walk up and down stairs. He, according to his doctor and to Joy’s own mother, is doing well and thriving. His initial hesitance with the world at the beginning of their post-“room” journey is contrasted with the end of the film in which Joy and Jack return to “room” in order to say goodbye and close that chapter of their lives. Tremblay is a gem. His innocence and faith in hope and beautiful things is what saves Joy. When she’s admitted to the hospital and Joy’s grandmother and her boyfriend Leo are tasked with taking care of Jack, he begins to grow. He learns how to play with others and to have fun. But his earnestness over cutting his hair is such a turning point in this film. It marks Jack’s separation from “room” but also serves as a beautiful parallel. See, when Joy tells Jack that she is getting them out of “room” and the boy objects, Joy says: “I choose for both of us.” In anger, Jack says this to her on the phone after the escape, but it is in this moment –– when he chooses to cut his hair and send it to his mother so she has his “strength” –– that Jack really chooses for the both of them. He chooses LIFE. He makes that decision for his mother and he will not allow her to make another one. It’s this love, this beauty in hope amid brokenness that makes Room such a compelling and engaging story. The film is more hopeful than the novel is, honestly, and I think that choice was an important one to make. Jack succeeds, slowly, in making connections and in discovering the beauty around him. And Joy is pulled back from her pain and, while she unravels, she realizes how important life is. She learns to see life through the eyes of Jack and in those eyes, there is always something to marvel at. There is always something in the world to see that is beautiful. For so long, Joy was fearful that she would never see the world again and for so long, all she knew to be true was the struggle. When she returns to the world after “room,” this is still true. She tells her mother, emotionally, that she should be happy and grateful for her freedom but within her mind, she is still trapped in “room.” She is still broken and the thing that gives her hope is living her life alongside Jack –– a boy who sees the world for the first time. In so many ways, Joy is seeing the world for the first time, too. And through Jack’s eyes, everything about the world holds promise and hope. Isn’t that a mesmerizingly hopeful story to tell and something we all need to latch onto?